Disc-shaped object spotted hovering behind ship after ship loses power and electronic equipment. Ships log entry missing. Noticed as passing by lake..a trangle shape craft..approximately 25 feet above the lake..hovering..having a wide beam of light shining onto the water..it seemed like water was being drawn up into it.. Approximately five minutes it took off slowly, got higher, then zoom gone. U.S. Navy sailor witnessed ball of light mirroring ships course/speed then ascended rapidly. SC, MYRTLE BEACH/ HORRY CO. Saw over water. Descended into water. Lit up water for one-half mile easterly direction. A: I remember watching science fiction as a kid, but I did not consider UFOs and ETs part of my world until I saw one for myself back in high school in Lynchburg Virginia, spring 1980. My school friends and I saw a classic flying saucer up close, 200 feet in my case. Even then it took me 10 years or better to start reaching out to other witnesses. I came online in 1995. That’s when I started to get involved. However despite my amazing sightings, I am more from the school of Alien Abduction than anything else. My actual close encounters were with mechanical machines in the sky, but my interest is in what is behind those things. I sought out ET. I might have found it… I wonder. I do understand the difference between what is subjective and what is objective. I respect that for the sake of science. However, somehow the subjective still fascinates me more… I wonder if there are things yet to be discovered regarding the mind. Especially when you consider ET as a telepathic being. Interestingly enough, despite my amazing rare objective close quarter sightings witnessed by others; it is what I experienced subjectively that changed me. I met ET very vividly in my dreams and visions even before I knew what ET looked like. What was that? A fellow art student had to tell me I was painting a picture of ET in class. He called it a “Grey.” I had never heard the term. That was just the beginning of it. Oh boy do I have a story to tell. Q: Throughout history, what case do you find most interesting? A: I could say many different things, but I guess the Travis Walton abduction is perhaps the most intriguing to me because he fought the ETs and ultimately they left him alone. Of course if you just can’t believe the story, it does not matter. However something similar happened to me, so my ears perked up when I first learned of the story. I call it my “Year of Fear” when I was plagued by dreams and visions of ET and I beat it somehow. I’m sure this was a perfectly explainable psychological event. However, this changed my whole life even more than seeing the actual craft above me. It’s like my genetic code was rewritten during that time. I am someone new now. I became better… But the path to that change was not pleasant. Strieber’s “Secret School” ended my fascination with Abduction because it was all way too close to home. I started remembering things… I started looking back over my life, wondering at the boundaries between the subjective experience I recall and something that could be quite profoundly real –that ET is more a part of our lives than we imagine. Of course the mythology supports this… I don’t want to go there… I still don’t. I have prayed to God all my life. Is ET hearing my prayers? What does that mean? You may see me arguing with researchers who want open contact… I am conflicted on that point. It all ended when I struck down an ET in a dream. Since that day, I have seen craft, but no ET. There was one incident recently since my interview with Hanger 1, but otherwise my life has been peaceful. Cases involving abduction generally spark the imagination. I wonder at the agenda of ET. I wonder what an advanced civilization would be like. I tend to see the whole enigma through that lens. A: Today, I am more interested in the cultural phenomenon of the folklore of UFOs than pure “ufology.” I find the conversation much more interesting. As a rational person, I regard ‘the debunk’ always! I preach it. I preach a rationally skeptical agnostic stance. I respect science… I am a science guy as an amateur futurist. I just don’t think science is even close to being there. I think the folklore is far more interesting. As a close quarter UFO witness, I feel detached from much of the UFO conversation. Much of what I see online I do not consider reality based on my own experiences. The field often seems lost in a quagmire of hoax, miss-identification, paranoia and wild speculation. I think the true enigma remains beyond the public grasp because of the popular hype, also because of the polarity of science on the issue…. It is getting better by the year. I see the speculation as far more interesting than the “science” frankly. The science has its place but as a witness I want to move on from proving they are real, debunking hoaxes, keeping the conversation rational, etc. … Rather what are they? What are they doing here? How long have they been here? After waiting 30 years for answers, the question of the reality of UFOs seems more like confronting the confusion of children. It's the wrong question. I don’t blame children for being ignorant, but I am bored with ignorant conversation and seek more adult company generally speaking. ... Frankly, I've seen the reality. Now what are they? I watch it now and then, but hate the show "Ancient Aliens" because they go too far all too often. However, I am in that school. …I see the very real possibility that ET has been here a long time. We may very well be part of them just as they are part of us. If you can’t go there, if you can’t allow that level of speculation, we are in a whole different universe. Q: Do you feel that Hangar 1, now in its second season, will be a positive force in gaining public awareness to the Mutual UFO Network and broadening the public’s view of UFOs? A: Yes… I sure learned a lot doing Hanger 1 this year. 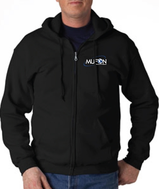 I even joined MUFON after being an unofficial affiliate for 20 years. If people watch, they will be informed. It’s a good thing. I want to comment on UFOs in documentary generally however: I am skeptical of anything that causes unwarranted fear and paranoia. The only fear in my own experience was the fear I brought myself. Obviously I am unharmed. I have a knee jerk reaction to paranoia generally. I wish UFO documentaries wouldn't go there so often. Creepy music and foggy nights seems cliche to me. I see a very positive side to this whole scenario. From my own experience, I believe we are on the verge of discovering something fantastically positive, not fantastically scary. I would like to see that side of the argument too. Q: Would you say a few things about your work in the UFO Disclosure Movement? Our UDM was just a huge email campaign. I personally emailed every major media outlet and political figure in the USA for example. Also, if you were involved in UFOs in the 90s, you probably got our email. We targeted everyone we could. The campaign went on for years. I retired cryptodesk.com in 2010. In my opinion, no amount of public conferences or video production will get the government to act on Disclosure. Appealing to politicians that are already in office under the old paradigm will not work. We have to convince the politicians running for office. We have to let them know we won’t vote for them unless they support our cause. We need to organize enough to where we are putting people in office who agree with us.